Where the heck did the month of May go? It seems to have slipped right by me, and with it, most of the month’s French Fridays with Dorie recipes. I’ll have a bit of catching up to do in the coming weeks. But this past week’s recipe, Anne Le Blanc’s Pistachio Avocado, was so darn easy that I can’t think of any possible excuse to miss it. Really, it was done in a matter of minutes. Even people who swear that they can’t cook could make this one. It’s that easy. Now, there are those who do not appreciate avocados, but I adore them. In fact, a perfectly ripe avocado ranks among my very favorite foods. So, needless to say at this point, I was very much looking forward to giving this recipe a try. And I love, love, loved this one! It’s a combination which I would have never thought of on my own and it is absolutely delicious. And now that I have discovered pistachio oil (YUM!) I will be looking for more ways to use it. I do hope that my fellow Doristas were able to find it. This entry was posted in french fridays with dorie and tagged Around my French Table, salad, starters, vegetarian. Bookmark the permalink. I love avocados too!!! But I’m more of a “plain with salt”, or add some spice and citrus type. So this was a bit much for me with the oil. That said, I’ll be looking for ways to use the oil since I made a whole batch!!! Glad you liked this so much!! I feel the same way about avocados! 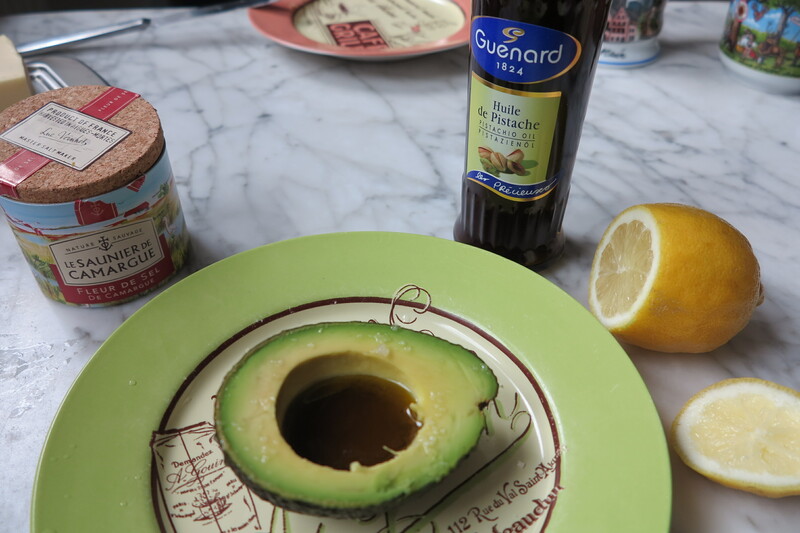 And now I must make a vinaigrette with the pistachio oil and use it in a green salad with avocados, ripe tomatoes…and who knows what else! Well…come see what I do to those who show up at my table and tell me they dislike avocados. There is nothing more sublime indeed. I just loved this. I can’t even say how much. Even the texture was a revelation. Great photos! Avocados are a creamy green heaven and anyone who wouldn’t want to dive into your pistachio soaked half is crazy. I liked this, both for its taste and for the reminder that elegant and delicious doesn’t have to be difficult. Imagine finding this as your first course at a dinner party – it would be as impressive as the most complicated recipe. and it seemed to go over well with all. 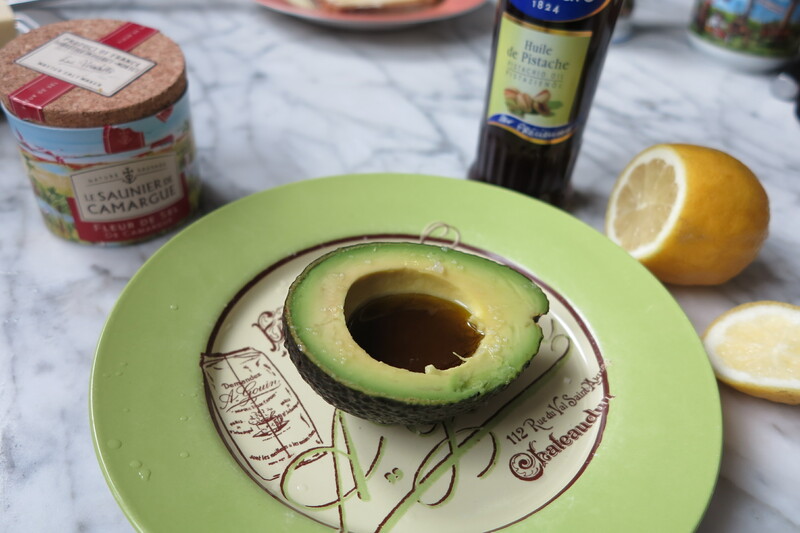 Avocados are winners with me, too! This was probably the easiest non-recipe we’ve done! Loved it! I also love your plates…very pretty! Glad you enjoyed this one! Happy weekend! I too adore avocados. And they have been propelled to a newfound glory with just a simple drizzle of pistachio oil. So glad you enjoyed this. Hope you had a good weekend. Rose, lovely presentation of your avocado – it was indeed all about the ingredients! Glad you could find the pistachio oil, it has a wonderful taste! Noch einen schönen restlichen Sonntagabend! I love avocados too. They are a staple in our house. This is the first time I tried pistachio oil. I made a homemade version. I’ve been drizzling it over salads this weekend. Delicious! I’m going to be on the prowl for pistachio oil from now on. I was foiled by awful avocados, but next time I find a good one, it’s on! Yes, everyone is raving about Pistachio Oil at a time when I am just using up everything I have on hand. I used Meyer Lemon olive oil which was sensational topped with Dukkah. But, by the end of this week I will have my kitchen finally in order (after 9 months) and have a list of to-buys: oil, vinegar and spices. Pistachio Oil goes to the top. So glad that you enjoyed this and that you’re back this week. I am still disappointed to have not been able to meet you as well as Andrea but I made the right discision. Hard as it may have been. Thank you for understanding.